Our Verdict: A well-produced and unique production by an acclaimed writer in a great space – you can’t go wrong! 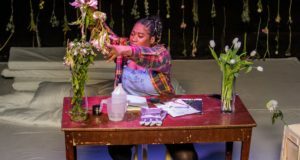 The Albany Theatre in Deptford is currently home to The Burial, a new play by acclaimed playwright Bola Agbaje. It is a production which spans generations, continents, cultures, and religions to tell the story of Fumi, who has been disowned by her father after moving from Nigeria to London and marrying a Buddhist man, Ike. When Fumi receives word that her father has died, she is forced to face their differences, and to cooperate with his wildly dramatic wife and mistress, in order to settle his affairs and find closure. 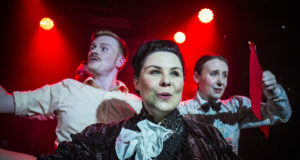 The play is part soul-search and part family comedy, and is without a doubt an engaging adventure from start to finish. It was my first trip to the Albany – an excellent venue in Deptford with a lovely modern café and excellent large and versatile performance space. The prime space allowed The Burial to be visually stunning, really adding an extra element to the show. The design is fantastic – staged in the round, a platform of hardwood floor rises out of a dirt bed, from which mementos of the past protrude, half-buried. The entirety of the play takes place in the front room of Ike and Fumi’s London flat, which is embellished with simple modern pieces and Ike’s meditation table. Lighting plays a huge role to establish between dream sequences and reality, and Derek Carlyle’s lighting does an excellent job of setting the mood throughout. The most unique and effective element is the live African drumming which echoes in the theatre throughout the production. Sola Bankola, the percussionist, is visible just beside the main entrance to the stage, and his rhythms set the tone for each scene. The show is well cast, featuring four lead actors supported by a small ensemble. All characters are family, though none are related by blood, and the cast does an excellent job of negotiating the tricky relations among them, especially considering the events of the patriarch’s death. Arguably the best aspect of the play is the conflict between Fumi’s stepmothers: her father’s legal, estranged wife, Aunty Iyabo, and the mistress he took as his wife in Nigeria, Ngozi, who was first a childhood friend of Fumi’s. Aside the obvious issues that come into play when a former wife and a current wife must collaborate, Iyabo is a Muslim while Ngozi is a Catholic. Their bickering is the life of the play in many ways. Karlina Grace (Iyabo) and Pamela Okoroafor (Ngozi) have a wildfire chemistry – it’s impossible not to be utterly engaged in the pair’s every interaction – they are strong, determined, and self-entitled women with an abundance of sass, and the resulting clash is beyond entertaining. While Kemi-Bo Jacobs (Fumi) and Tunji Lucas (Ike) keep the narrative grounded, their scenes leaned more often towards dull then those that features Grace and Okoroafor. 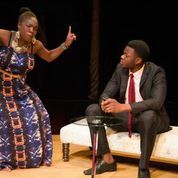 Bola Agbaje’s script is truly triumphant; it balances comedy and tragedy with ease and grace, and never fails to use beautiful language, without seeming flowery or over-indulgent. Her characters are strong; all three women are powerful figures moving through their own struggles with strength and integrity, and Agbaje creates a truly interesting dynamic between all of them, even if Iyabo and Ngozi shone a bit brighter in this particular production. It’s an excellent piece, well-polished and unique, and certainly continues Agbaje’s upward trend over the past several years. The Burial runs at the Albany Theatre until 11 May 2013.